Rabbi Yeshiyahu Krishevsky first victim to be identified; was run over by terrorist in Geula neighborhood. Funeral to commence shortly. Three people have been killed and as many as 17 others injured - some of them seriously - in two near-simultaneous terrorist attacks in Jerusalem. 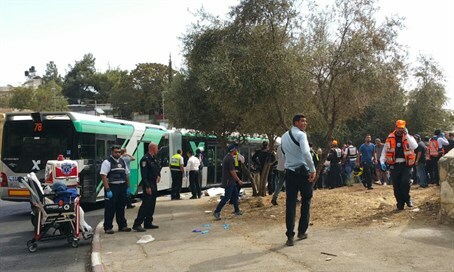 In the first incident, a 60-year-old man was killed and 15 others wounded, eight seriously, in a shooting attack on a Number 78 bus traveling along Gallows Street in Armon Hanatziv. Magen David Adom and United Hatzalah paramedics at the scene described chaos and multiple severe casualties. A second, critically wounded victim succumbed to his wounds nearly two hours later, bringing the death toll in that attack up to two. The attack involved two terrorists, one of whom was shot dead by police. The second terrorist was shot and wounded, and has been taken into custody. Early investigations indicate that the terrorists intended to hijack the bus, along with its passengers. It is not yet clear what they intended to do with the vehicle or their hostages afterwards. Minutes after that attack, a car and knife attack took place on Malchei Yisrael street. The terrorist in that attack reportedly plowed his car into a bus stop and then emerged brandishing a knife, stabbing several passersby. One person, later named as Rabbi Yeshiyahu Krishevsky, was killed in that attack, and another person was wounded. Paramedics treated the injured victim at the scene before transporting him to hospital in light condition. The terrorist was himself killed after being shot by a security guard, as well as several border police who arrived on the scene shortly afterwards. He has been identified as Jerusalem resident and Bezeq telephone company employee Alaa Abu Jamal. Abu Jamal carried out the attack with his company car and was even wearing his uniform at the time. Bezeq released a statement following the attack, saying: "Bezeq would like to express its deep outrage over the attack on Jerusalem's Malchei Yisrael Street, and over the terrorist action of one of its workers (who was killed during the attack). We are stunned and repulsed by the criminal act, and the deep hurt he has caused to the families of those killed. We are praying for the quick recovery of the wounded victims." The statement continued, "We emphasize that there were no warning signs, and there were no clear changes in the worker's conduct that could have prevented the act of terror. We will continue to follow the developments, and our hearts cry out with the victims and their families." Following the attacks, police have closed off all roads into Jerusalem. Prime Minister Binyamin Netanyahu has called an emergency security cabinet meeting. The latest attacks in Jerusalem came just over an hour after a terrorist stabbed and wounded a 32-year-old man in the central city of Ra'anana, before being overcome and beaten by other pedestrians. The injured victim has been hospitalized in light condition, with multiple stab wounds to his upper body, while the terrorist is currently in serious condition. Shortly after the Jerusalem attacks a second stabbing took place in Ra'anana, leaving four people injured. The terrorist was likewise subdued by passersby and arrested by police.